In order to understand what the Hydroponic System is, one must first understand what the Hydroponics means. By definition, the term Hydroponics simply means a method of growing plants in a water-based solution. Therefore, instead of using soil, the Hydroponic method uses nutrient-rich solutions that are mostly composed of water. In other words, the roots of the plants are all in direct contact with the nutrient solution while having access to other important elements such as oxygen and light. Since there is basically no soil, the root systems must be supported using inert mediums such as clay pellets or peat moss. Water: obviously being the most important element, water is definitely a necessity and must have certain qualities such as a certain level of salinity and a minimum of potentially harmful elements such as chlorides and boron. The growth rate of the plant will be significantly increased. If done correctly, the plant will grow up to 25% faster. On top of that, if rather than the traditional soil method, the hydroponic system method is used, it will produce up to 30% more. The reason for this is that the plants do not have to work as hard in order to obtain the same amount of nutrients; therefore, the plant will have to focus more on growing upwards rather than growing roots and expanding downwards. Another major advantage that the hydroponic method brings is reducing waste and pollution from soil runoff since the system is enclosed. Probably the biggest disadvantages of using hydroponic system method are the fact that it costs way more than using soil. Not to mention that setting up hydroponic systems may take some considerable time and effort. On top of that, since there is a lack of soil, the hydroponic system relies heavily on pumps; therefore, a failure in the pumps may lead to a serious problem and possibly killing the plants. The whole concept of wick system is that the cotton will be dipped in the water solution and the plants will absorb the nutrients and the necessary water via the wick. The main disadvantage of this method is that the plants may require an amount of water and nutrients that the wick cannot supply as fast as possible. 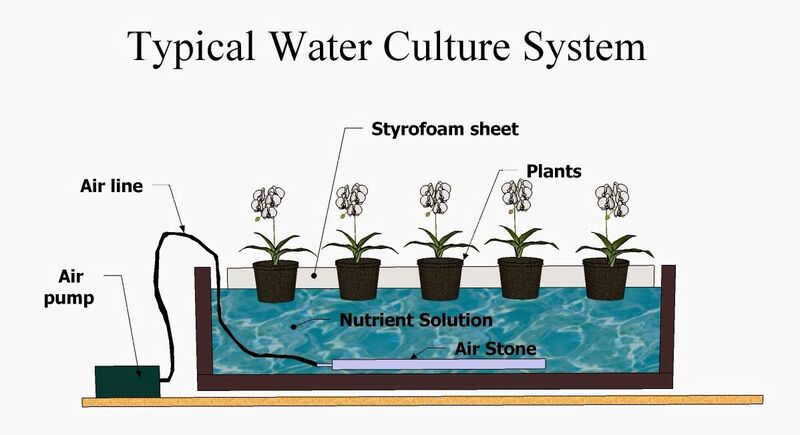 Deep water culture is a hydroponic method that is known for its simplicity. This method concerns the suspension of the plants above a nutrient water-based solution. In other words, the root system of the plants is completely submerged underwater all while having pumps and various other hoses pump up air filled with Oxygen in order to eliminate the possibility of overwatering. The main problem and con of this method are that any failure in the pumps may be fatal to the plants. The EBB and FLOW hydroponic system are fairly simple; the two main components of the EBB and FLOW system are a reservoir and a try. The reservoir is responsible for holding water and the nutrient solution. The grow tray which is also known as the food-table is sitting above the reservoir and connected via two tubes. One tube is connected with a water pump in the reservoir and is responsible for keeping the flow of the water steady. The other tube is connected with an overflow regulator responsible for delivering nutrients. The main pump attached with tubing in order to distribute water from the pump to the growing tubes. These growing tubes will help grow the plants. The NFT is best suited for growing smaller fast-growing plants such as lettuce. Aeroponic system is a hydroponic method that is not as common as the other growing methods; however, this does not mean that it is not as useful as the others. In an Aeroponic system, the roots of plants are misted with a nutrient solution all while being suspended in the air. Most gardeners and farmers use fine spray nozzles in order to get the solution to the exposed roots; however, it is not the only method but the most common and the least requiring of maintenance. In conclusion, since plants and greens are extremely important in our society, without them there would be no life, and they are essential elements to life on earth. Using soil to grow plants is the most common way of doing so; however, after years of research; it is now proven that this traditional method is not the ideal method for plants nor the environment. Thanks to the advancement of technology, mankind has managed to come up with alternative better solutions such as the hydroponic method. The hydroponic method is considered as a more efficient method compared the old soil growing method. However, even this improved solution is not ideal yet, because it has its own share of both advantages as well as disadvantages. How Smart Toothbrushes Can Teach Kids for Regular Brushing? What are the New Generations of Microcontrollers Used in Automotive Applications?